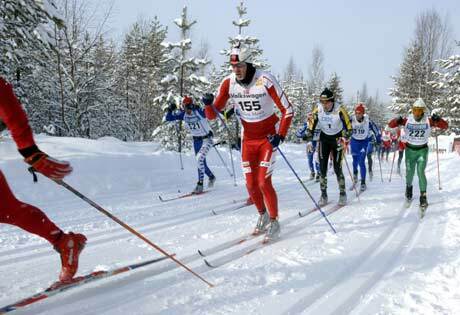 Today it is time again for the most famous and most awaited Swedish skiing race – Vasaloppet. It is also the biggest and longest skiing event of its kind in the world. Vasaloppet is always held on the first Sunday in March, and that since 1922. Why Vasaloppet? This stretch is said to be skied by Gustav Ericsson Vasa in 1520 on his escape from the Danish king Christian II who wanted to see him assassinated. Gustav was like the name says part of the Swedish king family and was crowned as King Gustav I in 1523. Read here the full story of the legend. The race starts in Sälen in Sweden and finishes in Mora. The distance is 90 kilometres, and nowadays for the skiing elite it takes just over 4 hours to get to the finish line. You can follow for example Daniel Tynell who is one of the Swedish elite skiers and currently on the 9th position. This is his race from 2009, and the graphics below his racing-times give you some kind of an idea of the skiing terrain. Maybe you know someone who takes part? Check them out on the same website. But Vasaloppet is not only for elite skiers. The race is open for everyone and also for skiers from all countries. For the average participant it takes between 7 and 9 hours to finish the race, some take longer time, some are faster. When Vasaloppet was in its baby shoes in the 1920’s a 7 hour finishing time was actually somewhat the best possible result. Nowadays the equipment and training got so advanced that this time could almost be halved. Have a look here and see what the first Vasaloppet-start in 1922 looked like and this is the start from today. Women were by the way allowed to participate in the first 2 years, 1922 and 1923. Without getting any prices, though. After that they were banned until 1980. Reason? It was not supposed to be good for a woman’s health and also, if women took part, the race could appear less tough. Tell that a female professional skier today 😉 . Lots of people will comment on Twitter as well, you can follow that here and find more information. Most tweets are Swedish, though. Vasaloppet has also its own YouTube-Channel and not to forget the SVT Livestream. Check out the most important food supply for all racers here – Blueberry-soup 🙂 . 92.000 liters this year. This entry was posted in Current Affairs, Life and tagged vasaloppet, winter by anmara. Bookmark the permalink.